On frequent visits, our girls delighted in lighting the tall, thin tapers stationed beneath statues of the great saints. In the days and weeks following the terrorist attacks of 9-11 back home, I reclaimed a sense of peace while tucked prayerfully in the corners of the cathedral softly illuminated by intricate stained glass windows. I have seen Notre Dame in every season. In the gloom of winter, it sparkles. On brisk fall days, its charm is magnified while sipping hot chocolate at the café across the Seine. Spring is best, when the flowering trees on the Île de la Cité bloom and lovers linger along the Quai de Montebello. For close to 900 years, Notre Dame has been a place that both showcases and transcends our collective understanding of human history — a place that celebrates human achievement but also stirs the desire to be spiritually embraced. Even in an age where fewer and fewer claim religious faith, Notre Dame has remained a timeless symbol of tradition, continuity, and permanence. As sure as the sun rises and sets each day, we have been comforted by a certainty that, always at the heart of Paris, Notre Dame stands firm. This spring will be different. The constant we perceive is perhaps not as secure as we imagine. Our comfort and certainty tumbled with a fiery crash yesterday along with the great spire that has watched over Paris for generations. Suddenly, we were reminded of our own vulnerability, indeed, of our own mortality. If even the most durable symbols of strength and grandeur can be compromised so easily, how much more fragile are we in our packages of flesh and blood. 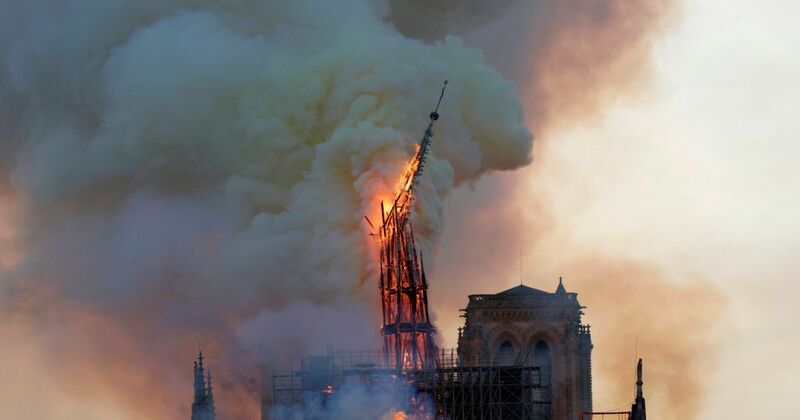 The fire burned through the night, but as the smoke cleared and a new day dawned, the two iconic bell towers remained intact and the three priceless rose windows have survived. Despite the loss of the roof and spire and significant damage to the choir and the nave, much of the edifice of Notre Dame has been saved. Already, promises have been made and money pledged to rebuild that which was lost. Why has the firestorm that enveloped and threatened to destroy Notre Dame the day after Palm Sunday so captured our attention? Why were the streets of Paris filled with prayerful citizens, tourists, and passersby even as the skies glowed hot with the angry blaze? Why were the eyes of the world fixed on Twitter and television reports from the City of Light? Perhaps the answer can be found in an understanding that Notre Dame embodies the sense of community, identity, and connection we all crave but too often neglect and increasingly perceive to be slipping away.